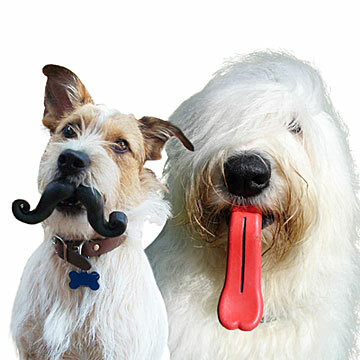 These wacky dog toys are made from non-toxic, solid natural rubber. Do dogs have a sense of humor? Their owners sure do, as evidenced by these wacky dog toys. Made from non-toxic, solid natural rubber, each ball is attached to either an enormous red tongue or a villainous handlebar mustache. Toss the ball out, and your dog brings it back in disguise. An instant conversation starter, it's sure to make you the star of the dog park. Made in China. This silly rubber tongue has already won 3 major awards! mustache: 6.5" x 3.5"; tongue: 11" x 3" x 6"
For medium, large and extra large dogs (over 40 pounds). This is just the funniest thing to see being carried around by your dog! Got one for my friend who has a handlebar mustache and his boxer. The other was for my friend's Yorkie from my cat. It weighs as much as he does. I thought this was the cutest pet toy I have ever seen and could not wait to give it to my dog nephew, however the ball was way too big for his mouth, so it did not fit like it should and he didn't seem to like it because of that; and it's not like he's a very small dog, he's a full grown beagle, so it should have fit. He's about the same size as the dog that's on the advertisement. Oh well, it was a cute idea though. Bought this for a secret Santa type exchange. The recipient loved it, even though her dogs don't neccisarilly chew on the right part. The chew on the tongue/mustache part rather than the ball which looks less funny but the dogs still love it. This was given as a gift to a huge dog-lover and since I wasn't sure of her style to purchase HER a personal gift, I thought she'd appreciate the next best thing: a gift for her dogs. She laughed and told me she'd take pictures of the pups playing with it. My dog likes all toys.. this one is his least favorite. I think the taste of the rubber is the problem. He doesn't play with it. My pit bull and my sisters German shepherd (who live together) love this toy! They are hard on toys and so far it has lasted! !